As The Fold begins, we meet Mike. Mike’s a small town guy who’s pretty content in his role as a high school English teacher – at least he tells himself he’s content. But when an old buddy calls him for a favor, it sets off a chain of events that will change Mike’s life forever – and whether that’s a good or bad thing is yet to be determined. Mike’s buddy is involved in some top secret government projects, and he needs Mike to personally check one out – the Albuquerque Door. So what is the Albuquerque Door, and why on earth would a high school English teacher be asked to investigate it? The answers to both questions are equally intriguing. A group of scientists have created the ultimate device – one that allows near instant teleportation. The Albuquerque Door is a bit like a set of portals. You walk through one side, and pop out the other in an entirely new location. It seems almost too good to be true, but its creators insist it is completely safe. Mike is being sent to investigate because he has an unique feature that makes him particularly useful in such an unpredictable situation – an eidetic memory. After just one exposure, Mike remembers absolutely everything, a skill that has caused him equal parts of joy and misery. Now, Mike will use those skills to figure out what exactly is going on with the Albuquerque Door project. He’ll face opposition from secretive scientists, the awkwardness of injecting himself into a close knit team, and a whole lot of information that couldn’t possibly be predicted. If Mike is right about what is really happening in this project, the fate of the entire world could hang in the balance. 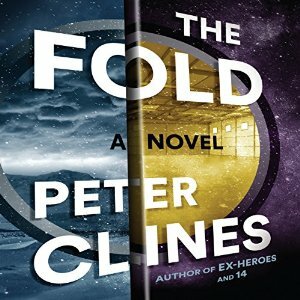 The Fold is one of those stories that grips you right from the start, but keeps you guessing right till the very end. Every time you think you have the story figured out, it takes another turn. Though it often veers off into completely unexpected territory, it never feels unbelievable. The characters are well developed, the story is gripping, and the narration gives you the feeling of being right there as it all goes down. The Fold is a great ride, and you’ll enjoy every minute (it isn’t family friendly though, so enjoy it without the kiddos).